Last month, we asked you to send us photos of yourself with your favorite musician, and to tell us about the time you waited outside the club in the freezing rain for hours and finally got to — gasp — MEET THE BAND! 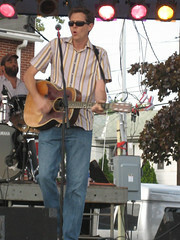 A couple of years ago my buddy George and I saw Robbie Fulks perform at the Black Swamp Arts and Music Festival. After Fulks’ set we wandered (well, stumbled…) over to the merchandise tent to buy some CDs and see if we could talk to the man. The couple in front of us in line asked Fulks if they could snap a photo with him. He happily obliged. Then it was my turn. 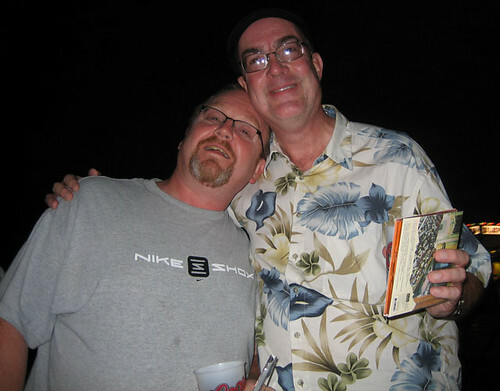 I congratulated Fulks on a great set, got him to autograph the CD I’d just purchased, and then handed him my camera and asked if he’d snap a photo of me and George. Fulks looked confused for a moment, then chuckled and took this photo.